Recent Canadian Grain Commission data for harvest 2018 revealed high levels of green seedcount, called DGR, thanks to an early September killer frost. Western Canada DGR levels reached 0.38 per cent (0.41 per cent in 2017) in No. 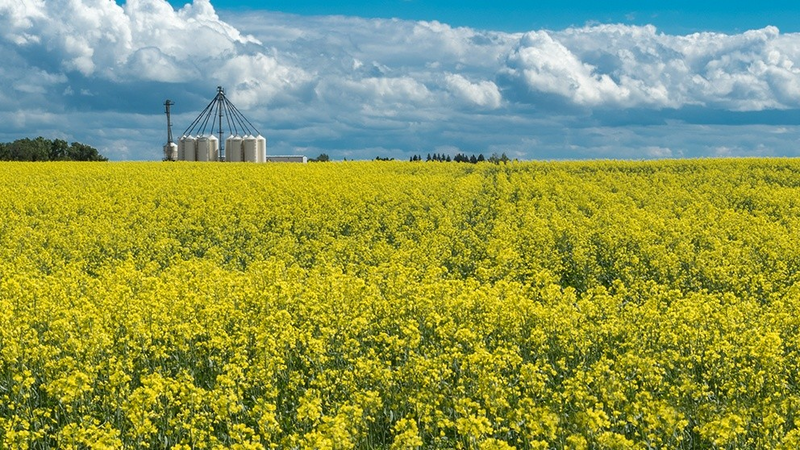 1 canola, 4.02 per cent (3.29 per cent in 2017) in No. 2, 12.04 per cent (8.51 per cent in 2017) in No. 3, and 32.87 per cent (7.17 per cent in 2017) in sample grade. Alberta was easily the most DGR-affected province. CGC’s Ann Puvirajah adds the lowest percentage of samples that graded No. 1 was found in Alberta-Peace River at 52.1 per cent. That area also reported the most damaged canola, with only 14.5 per cent of samples from its northwest grading No. 1. Delayed harvests and winter’s early arrival made cooling and moisture-removal impossible for some canola growers. Pockets of elevated moisture can put a whole bin at risk, and variations of moisture and temperature can create volatility, says Brackenreed. Green seed can be particularly more volatile in storage, and it’s important to keep the crop as cool as possible until delivery to limit the potential for deterioration, she says. Alberta Agriculture crop specialist Harry Brook explains aeration-equipped bins are great for keeping the air cool and preventing crop heating. But if aeration isn’t available and the bin is showing signs of heating up, the only other alternative is to auger out the canola and circulate it to cool it off, Brook says. Many options exist to monitor the bins to ensure canola stays in condition. “The most expensive way is using sensors on cables throughout the bins,” Brook says. There are even Wi-Fi connections to allow remote monitoring, but Brook adds it’s important to have someone there to turn on aeration or move the grain if an issue arises. “Other, less costly methods for monitoring can be as simple as a metal rod shoved into the bin, left for a time, then removed and checked for warmth,” Brook says. Higher green seed levels have experts urging greater care during storage. Ensure the crop remains cool, experts say, and maintain monitoring during storage.